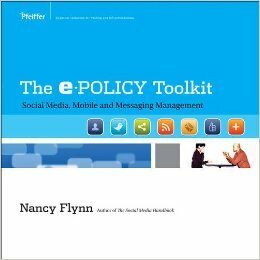 Nancy Flynn, author of The ePolicyToolkit and The e-Policy Handbook and founder of The ePolicy Institute, is recognized as a leading expert on the creation of effective, legally compliant electronic policies and other workplace policies. The implementation of a strategic policy management program—incorporating clear and comprehensive written rules & policies supported by formal employee education—can help you successfully manage behavior, mitigate risks (legal and organizational), and maximize compliance. You’ll leave this session armed with the skills and confidence necessary to write, edit, and implement effective policies and procedures. This interactive program combines lecture, discussion, and policy review. “What every business book should be: easy to understand, full of practical tips, and provocative….You might not find a more useful business book this year, or next, than [The e-Policy Handbook].” —Training magazine.